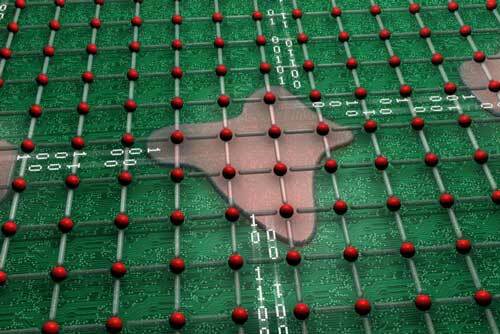 (Nanowerk News) Researchers studying the behavior of nanoscale materials at the Department of Energy’s Oak Ridge National Laboratory have uncovered remarkable behavior that could advance microprocessors beyond today’s silicon-based chips. The study, featured on the cover of Advanced Electronic Materials ("Chip Architectures: Multimodal Responses of Self-Organized Circuitry in Electronically Phase Separated Materials"), shows that a single crystal complex oxide material, when confined to micro- and nanoscales, can act like a multi-component electrical circuit. This behavior stems from an unusual feature of certain complex oxides called phase separation, in which tiny regions in the material exhibit vastly different electronic and magnetic properties. It means individual nanoscale regions in complex oxide materials can behave as self-organized circuit elements, which could support new multifunctional types of computing architectures. An ORNL study found that complex oxide materials can self-organize into electrical circuits, which creates the possibility for new types of computer chips. Because the phases respond to both magnetic and electrical fields, the material can be controlled in multiple ways, which creates the possibility for new types of computer chips. As the computing industry looks to move past the limits of silicon-based chips, the ORNL proof-of-principle experiment shows that phase separated materials could be a way beyond the “one-chip-fits-all” approach. Unlike a chip that performs only one role, a multifunctional chip could handle several inputs and outputs that are tailored to the needs of a specific application. The researchers demonstrated their approach on a material called LPCMO, but Ward notes that other phase-separated materials have different properties that engineers could tap into.